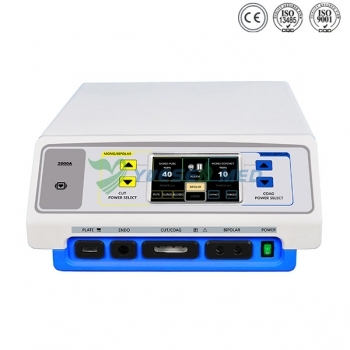 ★ Max 300W Electrosurgical Generator, with mono-polar and bipolar function. ★ Seven working modes: pure cut, blend1, blend2, contact coag, forced coag, bipolar coag, bipolar cut. cardiology, gynecology, urology(under water TUR), oncology, neurosurgery, etc. and errors codes during the process of outputting. 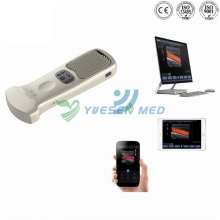 ★ Return Electrode Monitoring system and Power Peak System, minimizing the risk of tissue damage. ★ Both hand and foot controlled. ★ Separate power display and outlet socket for mono-polar cut, mono-polar coag, bipolar cut and bipolar coag, each output can be individually configured. ★ The unit always remember the last setting when it turned off. ★ Remote control function. 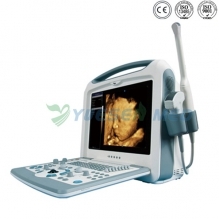 The surgeon can adjust the outputs by power control ESU pencil. ★ The ESU unit can be connected with laparoscope and endoscope, etc. ★ Protection against over-voltage and over-current. ★ Convection refrigeration without ventilator. ★ Mounted on a 4 wheels cart(optional). ★ Meets the requirements of international safety standards EN60601-1 and EN60601-2.